On New Year's Eve Terry Turner's home was vandalized. What was supposed to be a quiet and yet celebratory night turned out to be anything but as Terry's windows were broken with rocks. After calling 911 Turner and her granddaughter retreated from the house by climbing out of the windows, as she was unsure if strangers were in her home. 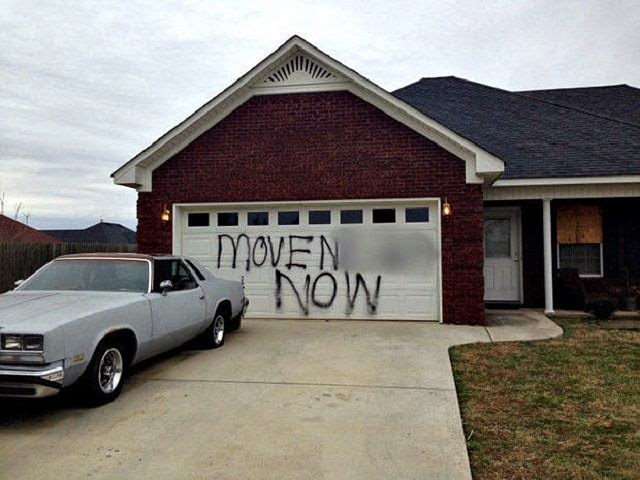 When the police arrived she learned that three windows had indeed been broken and that her garage was spray painted with the above message; "MOVE N---- NOW." Turner says she has lived in the neighborhood for years and while she has been verbally assaulted she never imagined that the attacks would lead to property damage. The reality of white violence when living in predominately white neighborhoods (school campuses included) is all too real and it is a shame that this experience will probably not be her last.